While Derik aready regaled you with the riveting report on Apple's 2009 proxy statement, he neglected to mention that—despite the economic downtown and Apple's reduced presence at Macworld this year—three of the top brass are getting raises. 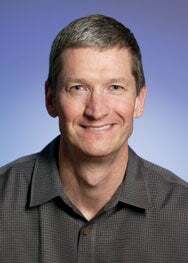 COO Tim Cook (pictured), CFO Peter Oppenheimer and Senior VP Bob Mansfield will now rake in a yearly $800,000, $700,000 and $600,000 respectively. That makes Mansfield the third-highest paid exec in Cupertino—remember, Steve still makes just $1 a year (and all those additional perks). These were the first such raises for the first two in just over three years. I realize that that's probably chump change to a company with a market cap of $80 billion, but still, that's a ton more than I'll ever make.